Your first steps in Movie Edit Pro, led by our video experts. The tutorial videos provide you with important tips & tricks about all program functions. The fastest way to your own videos! Note: Some videos may display the interface for earlier versions of MAGIX Movie Edit Pro. However, the features and operations displayed are largely the same. 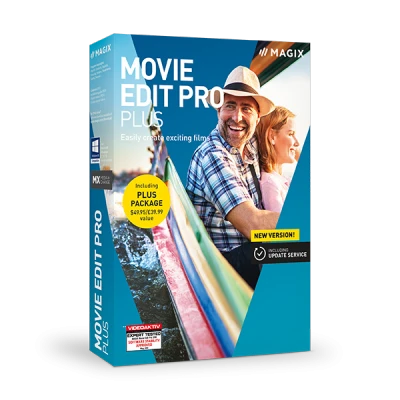 The introductory video will show you the basic functions of MAGIX Movie Edit Pro. We'll create a new project, import videos and play them back in different ways. Then we'll show you the most important edits and spend some time talking about export and burning functions. 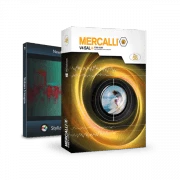 The new Media Pool contains all templates, effects and music under Templates and Audio. Everything is organized according to category. In the Media Pool you can also access the new Movie Edit Pro Store, where there's a wide range of templates. The first step is importing. What's the best way to get your material into the program? Here you'll see the best way to import videos and other media, or how you can record from connected devices. There are three different display modes for editing. In the scene overview, you can sort movie scenes at a glance. In story mode you can arrange scenes and apply titles and effects to them. Timeline mode is where more complicated edits are made. 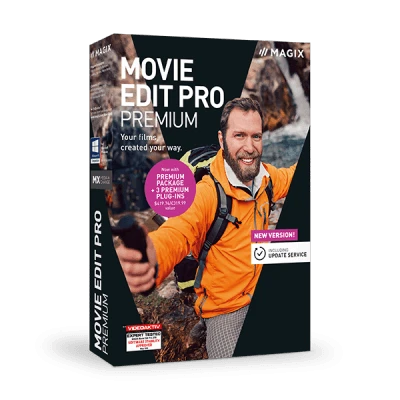 Movie Edit Pro offers tons of professional video effects for optimising images or making creative distortions. This video clip will show you the best way to use video effects. Mixing foregrounds and backgrounds will also be explained. Still shots, titles and even videos can often benefit from a little more movement. This video clips will show you everything you need to know about simulating tracking shots and zooms, image rotations, reflections and three dimensional molds. Interactive 360° videos contain a full panoramic view. You can change the perspective at any position by clicking and dragging the video image with the mouse. We'll show you how you can make such videos here. Some effects should change over time. Image enhancements such as brightness or contrast can be used to create dynamic effects with Keyframes. Even tracking shots can be controlled using Keyframes. This video clip will show you how you can use Keyframes. As soon as you are finished with your project, you can burn it directly to disc to be presented on a television. Using the disc menu, you can jump directly to individual movies and scenes. The disc menu can be arranged in various ways. In larger projects with high-resolution material the playback process might not be smooth. You can find tips & tricks to remedy this problem. The movie templates can be used to transform your photos into short, professional clips. These types of clips can, for example, be published online as trailers for your movie, or you can send them to friends via email. All you have to do is replace the placeholders in the movie template with your own video footage and change the title. Automatic scene recognition helps you break up longer videos into individual scenes. This function analyses recordings for image cuts. The scenes that are identified can be saved as takes and arranged in a new order. The effects in MAGIX Movie Edit Pro can be applied not only to entire images, but also to individual areas. You can do this with the help of effects masks. This video will show you how to use these. For recordings with several locations, it is often important to communicate location changes. The easiest way to do this is with travel route animations. We'll show you how you can create a small clip with your personal travel route in no time at all. Give your videos more depth by adding a third dimension. This video will show you how you can import and edit recordings from a Stereo 3D camera. The video will also explain the 3D export operations "anaglyph" and "Side-by-Side". This video will show you how to import your videos precisely to the desired tracks, use the track headers properly, as well as organize, name and assign colors to your tracks for more clarity and organization in your projects.